I watched the ‘Leaders’ Debate’ last night. Apart from two nationalists, both significantly women and including the almost poetically compelling Leanne Wood, I wasn’t impressed by what I saw. I didn’t expect to be. There’s no point my adding to the online flotsam by ranting on about why. I’m just going to suggest one of the root causes, take a positive attitude to solving it, and then tell you who to vote for! The underlying pattern last night, the usual selective quoting of facts and quasi-facts along with abstract rhetoric and a concentration on the faults of the other side(s), stems from Party. Individual politicians’ primary purpose is to get elected or re-elected. Political parties’ primary purpose is to get as many members elected as possible or, rather, to have enough elected to form a majority, take control and allocate Ministerial office to their most powerful members. The only solution I can see is to bring back genuine representative democracy at constituency level. That means people voting for the individual (not the party) they believe will best represent the interests of the constituency in which they live. Government, including dealing with all those necessarily national and international issues, then stems from these elected individuals aggregating around policies or leaders in which they believe. Perhaps that’s how parties started – though I’m inclined to believe they derived from existing outside interests – but the party is no longer a necessary piece of infrastructure. There are now sufficient technological and communications means for a crowd of elected representatives to broker and organise a majority, and an allocation of roles, around a set of sufficiently consensus policies and agendas. Is there really a reason why power could not flow upwards and inwards from representatives of the people, rather than downwards from the tyranny of party nomination? I’m not going to tackle the big theory here [I’m sure there are hundreds of people whose day job that is in academic institutions around the country] nor am I going to suggest a detailed mechanism. But this principal, that politics would be better if elected representatives were loyal and accountable to their constituency electorate rather than to their party, does point to something that you can and should do, right now, for this general election. If enough people were to do this, pledged to do this, the party monoliths would start to at least crumble a bit around the edges – as nervous candidates saw their future riding on genuine local engagement. It involves going to a bit of effort, but it will then demand some corresponding effort from your local candidates. I think politicians rely on us ultimately being too busy, too turned off, or just too lazy, to do this sort of thing. Get in touch with your local candidates – or at least as many as you can. Don’t limit yourself to big parties or ‘those who have a chance’. [Even their accessibility and responsiveness should be your first clue]. What are the priority issues for the majority of people who live in this constituency? What hard evidence do you have that these are really their priorities – rather than your projecting a national party agenda onto this constituency? What practical steps have you taken, over how long a period, to help local people to identify and express those priorities? Parliamentary candidates talk about wanting to have the privilege of serving their community. 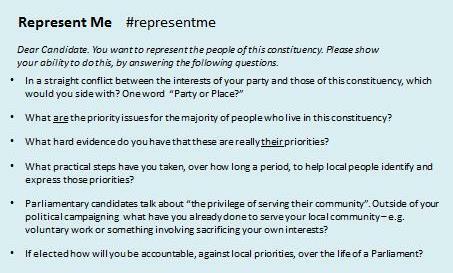 Outside of your political campaigning (and anything done in the capacity of MP if you are seeking re-election) what have you already done to serve your local community – e.g. voluntary work or something involving sacrificing your own interests? If elected how will you make yourself accountable, against those local priorities, over the life of a Parliament? Share their answers, or the fact that they don’t give you answers, with as many other people as you can. After all, each candidate should only have one set of answers, so it only takes one constituent to ‘get through’ and obtain them…. these can all then be shared and compared between candidates. That is my proposal. You should vote for the person who gives the best account of how they can earn your vote, by making it count, by representing the diverse and complex beliefs and interests of local people, by representing you. DON’T take any old central office flannel – look for hard, simple answers, backed up by evidence of local knowledge and action. Good answers will only come from remarkable people. We need our MPs to be remarkable people – not party footsoldiers. If you support this idea. You want to be properly represented? Fed up with cartoon politics and political marketing? Do something about it. Don’t vote for a ‘protest party‘, vote for a candidate who will plausibly undertake to represent you, and your place. Visibly support, and rally support for, candidates who are prepared to do that on record. It’s a start.